The book will be of interest to academia and engineers involved in industrial safety, structural reliability, quantified risk assessment and safety management. Risk analysis, structural reliability and human reliability analysis concentrate on different aspects that complement each other, and in many cases they can be considered separately. As a result of this, and of the different characteristics of the techniques, until today the respective specialists have had little interaction, and not enough efforts have been made to integrate methods. This book, the result of SAFERELNET, a thematic network of 67 organizations from industry, universities and research organizations from 18 countries, is a first attempt to overcome this. Since 2001, SAFERELNET has dealt with providing safe and cost-effective solutions for industrial products, systems, facilities and structures across different industrial sectors. 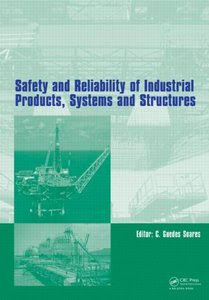 Safety and Reliability of Industrial Products, Systems and Structures covers all aspects of safety issues such as Risk Assessment Methodology; Human and Organisational Factors in Risk Assessments; Integration of Risk and Reliability Formulations; Reliability Based Design; Assessment of Existing Structures and Life Extension; Risk Based Inspection and Maintenance Planning, with a special focus on safety-critical systems in all types of industrial plants, equipment, structural systems, buildings and other civil engineering facilities. The book will be of interest to academia and engineers involved in industrial safety, structural reliability, quantified risk assessment and safety management.